Get ready for some big-time beggin'! 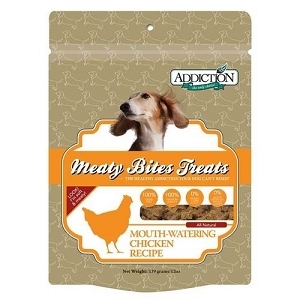 Snacks don't get any better than Addiction Meaty Bites Venison Dog Treats. They're grain-free bites made with all-natural ingredients that can be torn apart and used for training or tossed whole toward a hungry mouth to make any pup's day get that much better. 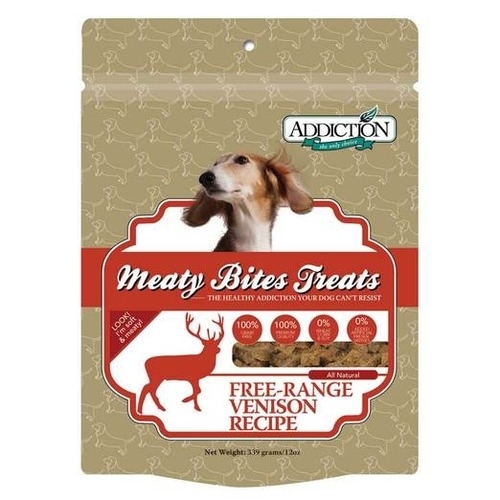 Limited-ingredient Meaty Bites Venison Treats are suitable for dogs of any age and perfect for pets with sensitive stomachs. 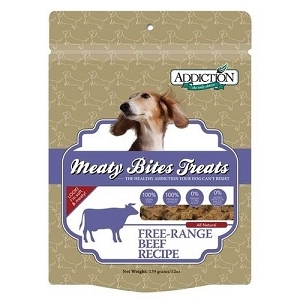 Addiction’s Grain-Free Meaty Bites are tasty, soft and packed with a wonderfully delicious and nutritious meat with a full, rich taste that dogs simply love! We use only the most succulent, free-range New Zealand venison as the No. 1 ingredient. So each tasty bite satisfies your dog’s natural craving for meat. Ideal for training or just pampering your furry friend, the moist and soft texture will leave your dog wanting more! Treat your dog to the only healthy treats delicious enough to be called ‘Addiction’! Addiction’s Meaty Bites are all natural and do not contain artificial preservatives. Seal the bag and store in a cool, dry place. Consume within 10 days from opening.